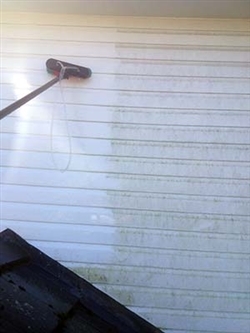 On white UPVC the environment can soon leave its mark with the build-up of dirt and algae, and your beautiful home or office can soon look unsightly. The good news is that with Falcon Maintenance’s unique and innovative UPVC cleaning solutions we can turn the clock back and restore your UPVC fascias and soffits to look clean and like new. We are well equipped to access all of those hard to reach areas of your home where we will use the latest in cleaning technology including our carbon fibre long reach water fed pole system complete with water jets and brushes or our extendable pressure washing lance. Where accessible we will clean your fascias and soffits by hand. We have several options and choose the one that best matches your needs. No harmful detergent or chemicals agents are used which could potentially discolour your UPVC. Through the use of our proven Falcon Maintenance UPVC cleaning methods we will provide you with excellent results that will leave your UPVC gleaming and looking like new.